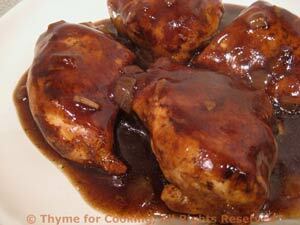 Chicken Breasts Balsamic, Weekly Menu Planner. Use whatever onion you have left. 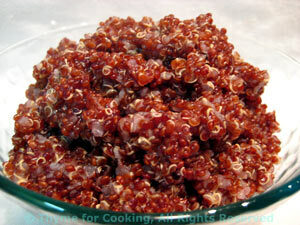 Quinoa comes in tan, red and black, but there is no appreciable difference in taste or cooking times. The little bit of brown sugar tempers the vinegar nicely. If you don't have Balsamic you can use sherry or red wine vinegar - but increase the sugar to 2 tsp. I cut the chicken breasts in half for a nicer serving portion. 1 tbs cornstarch (maizena) dissolved in 1 tbs chicken stock or water. Add chicken breasts and brown on both sides, about 10 minutes. Add onion and garlic and sauté 5 minutes longer. Add stock, vinegar and sugar, cover, reduce heat and simmer 10 minutes. Thicken sauce with cornstarch mixture (you may not need all of it) and serve. Green garlic and olive oil are a simple finish with fresh, spring flavors. Put in steamer basket in saucepan with an inch of water in bottom. Put on medium heat and steam for 10 - 12 minutes or just until done, careful not to overcook. In the same pan heat olive oil. Trim and slice the green garlic. Add to oil and sauté just until tender, about 3 minutes. 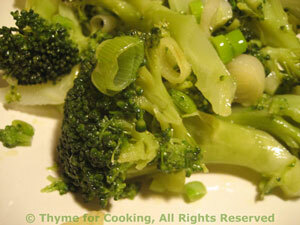 Add broccoli and toss well to coat. Serve.